In an effort to reach existing and new customers through social media engagement, Hooters tasked Largemouth to implement an approach with a heavy focus on digital buzz that would reach the highly sought-after millennial demographic. Millennials are the youngest and most active generation of mobile social networking users. Their habits are quickly becoming the new “default” for the generations that follow. Because of this, Largemouth worked with Hooters to craft a social media strategy surrounding Snapchat, the third most popular social app among millennials, and build buzz around the wing-eating destination’s Snapchat launch. With more than 100 Hooters Girls from around the world gathered in the same place, Largemouth focused on leveraging the 19th Annual Hooters International Swimsuit Pageant in Las Vegas, Nevada, as a way to generate excitement around Hooters’ Snapchat launch. By activating Hooters Girls to post on their personal accounts and aligning with existing Hooters social media accounts, Largemouth presented a timeline of suggested Facebook, Instagram and Twitter posts to share, encouraging Hooters fans to add “hooterslive” on Snapchat for behind-the-scenes access to exclusive content of Pageant week festivities. At the same time, Largemouth distributed a press release surrounding the Pageant and Hooters’ Snapchat launch to print, online and broadcast media across the nation to spark additional conversations. To start off with a bang, the reigning Miss Hooters International Janet Layug was tapped to be the face of the Snapchat account during the Pageant. From photoshoots and interviews to backstage activities and celebrity judge introductions, Janet took followers on a guided journey of Pageant week. In addition, Hooters was able to connect with fans in the Las Vegas area by announcing a surprise ticket giveaway contest on Snapchat. For the giveaway, Hooters promised to award the first person to find Janet at the new Hooters location inside Palms Casino with two free tickets to the swim suit competition. By following Largemouth’s suggested timeline of content during the 2015 Hooters International Swimsuit Pageant, Hooters reached the highly sought-after millennial demographic through unique content that prompted engagement. From its media outreach efforts, Largemouth secured a feature story in Digiday, where Hooters’ CMO Carl Sweat discussed how the brand appeals to a millennial audience and builds a live digital experience using Snapchat. 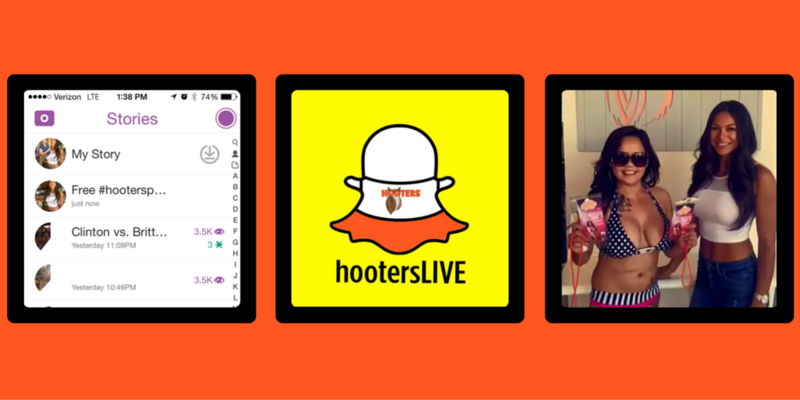 The success of Hooters’ Snapchat launch established a new avenue of communication for Hooters to continue to tell its brand story. Since its launch in June 2015, Hooters has continued to engage with fans by providing inside access to all things Hooters, including fantasy football draft parties, wing-eating championships, grand openings, Hooters Girls’ calendar signings and photo shoots, and much more.